Many people have a favorite spot to sit in on their sofa. Over time, you will notice that one side, or that certain “spot” will look smooshed and flattened out. Rotate your sofa cushions every couple of months to keep them looking plump and fresh. Also, try to avoid down filled sofas. I know they’re comfy, but they really start looking like a mess within just a few weeks of use. 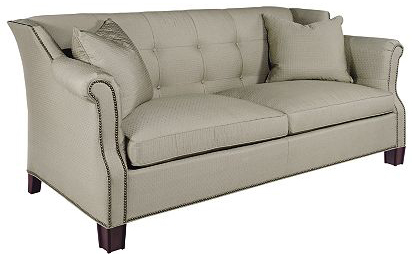 A sofa with cushions with spring down (foam insert wrapped with layers of down coating) will hold its shape better. There are also hypo-allergenic options for those who need to stay away from feathers altogether. Remember, a well made sofa is a good investment. Do your homework before you purchase!